For the last few months , I had the opportunity to try out the new ASP.NET MVC 4 from CampusMVP “Expert Web Development with ASP.NET MVC 4” which is an insightful course on ASP.NET MVC . In one of my previous blog post , I shared a preview of the Expert Web Development with ASP.NET MVC 4 course .In this blog post , I will share some of my experiences of the Expert Web Development with ASP.NET MVC 4. This course covers 10 modules that are related to the ASP.NET MVC 4 Web Development . The course is designed and presenter by Jose M. Aguilar who is a ASP.NET/IIS MVP and one of the well known speaker / author in the .NET Community. The Course provides 3 months complete access and also expert trainer (MVP/MCT) support during the course. Coding examples , Lab , practice videos , self evaluation test adds great value to the course. The UI and the navigation is very simple and easy to use and learn as well . 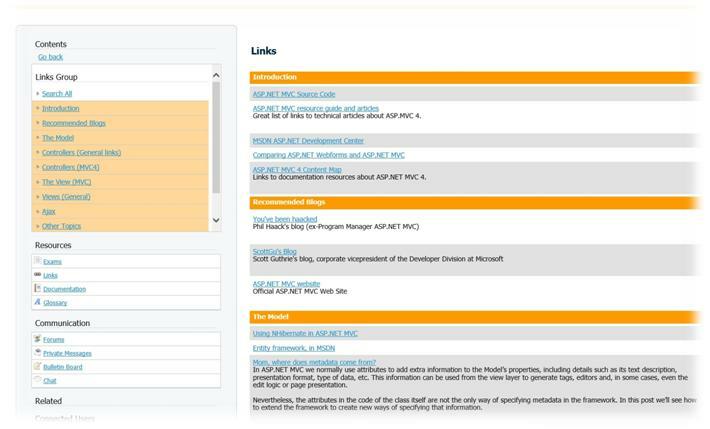 The Home screen provides an overview of the current modules and the next steps in the course . The Notification area provides the users with a quick overview of the list of mails , communications , statistics etc. Not just the course , the Expert Web Development with ASP.NET MVC 4 also includes excellent references to various links , documentation and Glossary. The Exams section lets the candidates take up the assessment and later track it from the dashboard. Looking for additional links or references for learning ASP.NET MVC ? The Links sections is for you . This section has links to various popular blogs , ASP.NET developer center and other excellent resources which are grouped by topics for easy access. The documentation section includes various couple of documents and the sample code used in each chapters for Visual Studio 2010 and Visual Studio 2012. 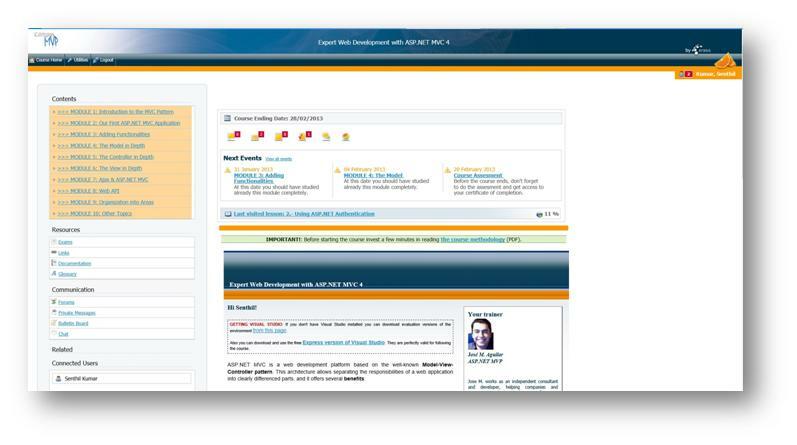 The Communication section can be utilized to interact with the trainer or post questions in the forums / Bulletin Board . The Private Messages sections allows the candidates to send and receive messages between the course viewers. The Expert Web Development with ASP.NET MVC 4 is currently priced at $470 . You could find the complete course details and the price from CampusMVP website. The Chapter 10 contains a Sample Application: MVC Music Store . It would be great to have more chapters on developing application from start to end. Although the course is in English , there are couple of screens with Spanish text on the header .(minor). Private Messages could include easier way to reply to messages.